How do I get wireless internet? - Ask Leo! You hear a lot about the wireless internet, but it's not something you can just connect to anywhere. It's more often something you purchase and set up. We have dial-up at our house and I’m sick of it. I can get on the internet from my iPod at the edge of my property, but I want internet on my desktop IN my house. What do I need to connect up? Wireless internet is not just “out there” to connect to. You need to take steps, whether it’s setting something up, paying for something, or at a minimum, asking for permission. It’s definitely not the case that you can just grab a wireless card and suddenly be connected anywhere you want. The wireless capabilities of your computer are only half of what’s needed. There are several approaches to getting a wireless internet connection. WiFi is a medium range wireless networking protocol. By medium range, I mean that its range is typically around 30 to 300 feet, depending on conditions. That means you need to be fairly close to it. The most common WiFi setup is to get a WiFi router or access point and connect it to your own wired internet connection. For example, you might upgrade and get a DSL connection, and then place a WiFi router on that connection so that you can get the internet wirelessly anywhere in your home. The second most common WiFi setup is the public WiFi hotspot. This is exactly the same as what I’ve described you do in the home: the hotspot owner has a wired internet connection to which they’ve connected a WiFi router or access point and explicitly left it in the unsecure open mode for anyone to use. The key take-away here for WiFi is that it’s not everywhere. You need to either setup a WiFi access point yourself that connects to your wired internet connection or be close enough to a free hotspot to make use of it (more on that below). WiMax is a longer range wireless technology. Its range is typically measured in single digit miles. Much like cellular, which I’ll discuss in a moment, WiMax uses a network of transmitters (equivalent to WiFi access points, but much more powerful) to give a large geographic area of coverage. You get WiMax by signing up for WiMax service with a provider. They’ll then provide you with the hardware and account necessary to connect up. The WiFi ability of your laptop has nothing to do with this; WiMax is a different technology. The cellular phone network is a large digital network, so it’s no surprise that it can be used for internet connectivity as well. 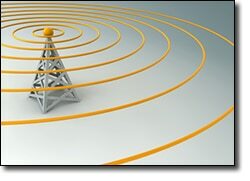 The coverage area is perhaps the largest of all – pretty much anywhere your cellular phone will work. It’s not as fast as WiFi or WiMax, but that’s improving over time. Like WiMax, you’ll typically need to sign up for a data plan with your cellular carrier. Also like WiMax, you’ll need additional hardware – your WiFi capability has no relationship to cellular. The additional hardware might be as simple as a cable or Bluetooth connection to your existing phone. Or it might be an additional cellular network adapter for your computer or home. No, it’s not an option, but I have to mention it because many people seem to think it is because it’s wireless. Bluetooth is an extremely short-range wireless connectivity technology. By extremely short range, I mean 10-30 feet. Just far enough to connect to your wireless keyboard or mouse. It is not a means to get wireless internet connectivity. When it’s used in conjunction with something like your cellular phone, it’s the cellular network that’s providing your internet. Bluetooth is just providing that last hop between your cell phone and your computer. This is typically the response I get, “proving” that I’m wrong and there must be WiFi everywhere. That’s not terribly surprising. The iPod uses WiFi and chances are an open WiFi access point is close enough to that side of your property to be in range. The point is that it’s someone else’s WiFi. Do you have permission to use it? Someone else is paying for it. They’re presumably paying for a wired connection and have purchased the hardware to set up the WiFi access point. Just because you can connect doesn’t mean that it’s appropriate for you to do so. In many cases, it might even be illegal. If it’s a neighbor … well, they should have set up encryption to prevent just this scenario, but even if they didn’t, that doesn’t mean it’s appropriate for you just to connect. If they give you permission, then your solution might be to try a WiFi repeater or range extender in your home or getting a larger antenna on your wireless device. I’ll caution that this isn’t always simple. Wireless networking seems to be partly magic, but it’s the direction that I’d steer you in once you had permission to do so. But remember, if you’re using someone else’s internet connection, they can monitor your traffic. In the long run, my actual recommendation is to upgrade to DSL or some other technology for you home and then get a WiFi router of your own. Be sure to password protect that WiFi connection so that someone doesn’t steal your internet connection because they just happen to be close enough. « Previous post: Why do I get spam that’s not addressed to me? Working for a WISP – I continually have to explain that wireless isn’t a ubiguitous service. And then try to determine which wireless technology is being discussed so I can then explain what that particular technology really is. We live in the country and have a wireless connection to our ISP. The wireless signal comes from on top of a water tower 3 miles away. We can not receive wired cable nor DSL because we are too remote. This signal is received and changed to a frequency which can be distributed by our wireless connection within our house. Great subject! Informative answers! But don’t forget about Satellite internet. The prices are comming down. I live in the country and have only dial-up. I’ve checked some different options and I found I can get broadband high speed for about $15 a week and not have to buy anything. Satellite Internet is, indeed, another wireless connection type, and it’s a somewhat older one than most of the ones discussed in this article, thus we could say the technology is “proven”. However, its low adoption rate is not solely because of its price. – firstly, and most importantly, satellite connections suffer from high latency. This is a function of basic physics — the satellites are far enough away from any point on the surface of Earth that it takes a non-trivial amount of time for data in the form of electro-magnetic impulses to reach them, reach the other point, and return. My current Internet connection gives me latencies on the order of 150 milliseconds, on average, from Romania (Eastern Europe) to the United States. By comparison, for satellite access you could be looking at latencies as high as 1 or 2 seconds (thousands of milliseconds!) for a roundtrip to a server that might be just a couple of miles away. And that’s on top of the pre-existing round-trip from the other end of the satellite connection to the server you’re trying to reach. – secondly, weather: as documented on Wikipedia, “[satellite] communications [are] affected by moisture and rain in the path of signal”; meaning, effectively, that a rainy day in the summer might leave you with a crippled, if not completely non-functional Internet connection. Add to that the likelihood of snow build-up on the satellite receiver dish, and thus the requirement of continuous maintenance, and it makes for a somewhat unreasonable connectivity solution. – the third, least important but still potentially crippling disadvantage is that most satellite Internet providers tend to offer one-directional access only. That is, download-only (from the Internet to your computer). But all communication on the Internet, by virtue of the design of the TCP/IP protocol, is bi-directional: all packets sent must be acknowledged, and don’t get me started on the three-way handshake. What this all means is that you might still have to keep your dial-up connection and use it for the opposite direction, which will effectively slow down your communications to the rate at which your dial-up connection is capable of routing the acknowledging packets, which, although obviously smaller than the primary communication ones, are still a limiting factor. There is also the further limitation of line of sight, specifically the communication-dampening effects of vegetation, meaning more continuous maintenance to ensure a tree (or, in a city environment, a building!) doesn’t come between your receiver dish and the satellite it’s trying to reach. But the trifecta of latency, weather, and unidirectionality provides strong incentives to stay away from satellite connections except as a last resort. I’m also suspicious of your final statement of “not [having] to buy anything”, since contacting a satellite absolutely requires the existence of a satellite dish, but perhaps you already have that for TV. If you’re curious, the uni-directionality limitation results from the fact that satellite communications are generally optimized for TV-like systems, whereby there is a single sender and many recipients. By contrast, an Internet connection by design is point-to-point, there being a sender-recipient pair for each such connection. This effectively results in satellites being a very poor method of transmission, having a very limited number of channels, which accounts for the relatively high cost of connection. Simply put, a satellite with, say, 1,000 channels could broadcast 1,000 TV programmes to millions of viewers (who are all receiving the exact same data), or it could provide Internet access to exactly 1,000 people. Some magic is probably possible by splitting the channels into smaller ones, but the result of that will necessarily be a lowering of speed, and you may end up with a bandwidth the same as a dial-up connection but with a much higher latency. I didn’t mean for such a long treatise of satellite connections, but I feel I’ve done a reasonable job of describing the pitfalls there. I’d like to restate that it could still be a reasonable option, just not one that is likely to be reasonably priced — either in upfront or hidden costs. There’s also one more limitation I hear about all the time: bandwidth capping. Since, as you’ve said, the transmission bandwidth is shared by some number of subscribers, the satellite providers often enforce equal access by capping the bandwidth of heavy users. That means that for a while I might get full-speed connectivity, but if I use it too much they’ll limit me to dial-up speeds so that others can have more equal access to the Sat. Personally, not something I could live with. Good day, yes Sir Leo right you must have a DSL connection first, Ok now you have an internet on your wifi, but for how long? You must know if they detect that you have an access on thier wifi they will absolutely put an en to your free wifi. So please understand and have your self a DSL connection. RE: Satellite Internet…I highly recommend it. While it certainly is not equivalent to DSL, Cable, etc., it is a major step up from dial-up service. I run a business from home in a very rural area and I’ve used WildBlue (through Dish Network) for 2+ years. I’ve been able to do things I never could have done with dialup, like download multiple MB files from my clients’ FTP servers in seconds (minutes for 100+MB), participate in webinars, view YouTube videos, etc. The relatively high latency that Narc referred to is trivial when compared with dialup. With regard to weather, I have experienced on rare occasion intermittent service but only during heavy downpours – a handful of times over the past 2 years. Snow buildup hasn’t been a problem for me, but that’s probably b/c the wind blows so hard here that the snow rarely has a chance to land until it becomes plastered against the side of a tree! 🙂 I also have a wireless router installed that allows me to use my laptop on the front porch during the summer. Certainly if DSL or cable were available to me, I’d choose one of those options. And, if you’re used to hi-speed landline service, the satellite speed would probably drive you insane. But in locations where dialup is the only other option, I wouldn’t hesitate to go for satellite service. Hello. I think this may sound daft but i really have to ask, im not to good with computer lingo. I already have a internet connection, broadband, one that is wired. Can i just go out and buy a wireless router and plug it in and will get wireless? or do i have to ring up telecom and gt them in to do evrythin then pay for wireless? or can i just continue paying my nrmal internet and get wireless through the router? All you need is that wireless router. Your telecom doesn’t need to know (and probably doesn’t care :-). If I have cable internet, get the wireless router, still pay cable internet, can I use the wireless internet to go online on a second computer in my home, or will I need to subscribe to cable internet on the second computer too? Nope. The router lets you share the one connection with as many computers as you like. I had dsl service and wireless router but I can not activate my laptop wireless I had to use the cables because I don’t know how to instal wireless on my dell laptop. Can you please help me. I live in the country where I am unable to get cable or DSL access, satellite is expensive & as you’ve noted before not always reliable. What are my options?? I have inheirited a lap top computer and it ther is a router with the desk top computer hooked up but my lap top still will not connect to the internet. I have tried unplugging and replugging everything and nothing has worked. What else should I try.? Could it possibly be password protected by my deceased loved one whom I inheirited it from? I read the articles on this page but don’t understand enough for them to be helpful. My husband purchased a hp laptop for me and it is hooked up to dial up because I had web tv. (I hate dial up). I want to go wireless and don’t have a clue how to start. I know this space is for comments but can you point me in the right direction? how do I get out of dial up and into wireless? Any info you can give me would be greatly appreciated. Thanks so much. 1) get a broadband connection like cable or DSL to replace your dialup, then 2) connect to that a broadband wireless router. I read these articles but im still having problems connecting. its more of a wire type thing. We had comcast come and connect a house phone. After that we were left to have to use a wire to connect to the internet. I’m thinking of getting a Virgin Mobile MiFi Mobile Hotspot device. If I’d like to hook my home PC up to it, do I only need a wireless adaptor? I know my Wii, PS3 and XBox 360 will hook up, no problem. I have astound dialup, and I also have a cisco linksys wireless router. I am try to configure my laptop with wifi to this wireless router. Can you give me some pointers. Is there are a way that I can connect to the internet without having to pay a monthly fee. It would be great. Especially since I am working from home. I used to have an internet connection, but it stopped showing up on my computer. The only legitimate way to do so that I’m aware of is to make use of free open WiFi hotspots at coffee shops and the like. The internet is kind of like electricity – if you want it at home, you need to pay for it. Sounds like you had a nearby neighbor who had an unprotected connection, and now they’ve turned it off. Seems like, if you are working from home, that it would be a good idea to have the protection and reliability of your own (paid) connection. I have a wireless link from an upper story in my home to where the router is located in the basement. I chronically show low wireless signal strength at the main computer upstairs. Often the link will drop out. Running MS troubleshooter usually finds nothing, but sometimes resets the adapter and all is well for a bit. 1. Where do I find repeaters, amplifiers, better antennas to add in for more signal strength? 2. This business of resetting the adapter – is that symptomatic of a problem? Is there an easier way to reset it, without going through all the network screens? You can get a wireless range extender (also known as a wireless repeater) in most stores that sell computers and/or computer components such as Microcenter, Fry’s or Best Buy, or online at NewEgg.com or Amazon.com. Resetting a device often fixes a problem with the device. It seems, in your case, that Microsoft troubleshooter is resetting the device in an attempt to solve the problem. This is perfectly normal. The easiest way to reset the adapter is usually to unplug it for 30 seconds and plug it in again. The adapter is in my computer, is it not? I can reset it manually with the keyboard. Sometimes it “seems” to fix the problem, but hard to be sure. My signal strength seems to run 1 bar out of 5, so it’s borderline to start with. Do you know how well those range extenders work? I am using an inexpensive NetGear range extender and it works very well. Once it’s set up, you log onto it the same way you would log on to a router. Another alternative is to use another wired router plugged into your main router. I have one of those for the other end of my house. Once set up, they both operate similarly. As for the reset problem, one thing I’d try instead of resetting is disconnecting from the network by clicking on the WiFi bars in the system tray and disconnecting from there. Trying to get internet on older desktop. I purchased usb wifi stick. I have Verizon hotspot on iPhone. Will this work? It should. That’s what a WiFi hotspot is for. If I am connected to a public WiFi hotspot then how can I stop them if they are monitoring my traffic? please tell me.